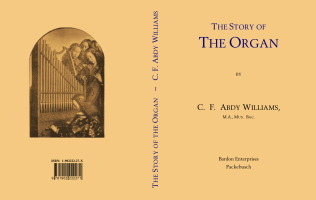 Description: This book chronicles the development of the organ from its beginnings in Greek and Roman times, as an hydraulus, through its development in Germany, France and England, to the beginning of the 20th century. It includes the development of the keyboard, stops and bellows, and other inventions in the 18th and 19th centuries; how the instrument has had its opponents which caused its destruction in some areas. There are appendixes that list organ builders, organ stops and technical terms, a bibliography and a number of organ specifications. Edition: New edition of 1903 edition.